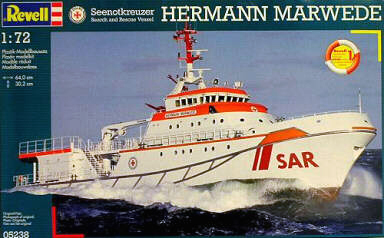 The DGzRS (translated literally as "German Society for Saving Shipwrecked," more commonly known as the German Maritime Rescue Service or GMRS) performs Search and Rescue missions in German waters. The service was founded in the late 1800s and is funded exclusively by contributions and endowments. Most of the personnel are volunteers. Hermann Marwede is the 46-meter (150') flagship of the organization and named after its founder, operating from the island of Helgoland in the North Sea. The ship carries a 9-meter surfboat Verena in its aft garage, and can support airborne operations from its flight deck. 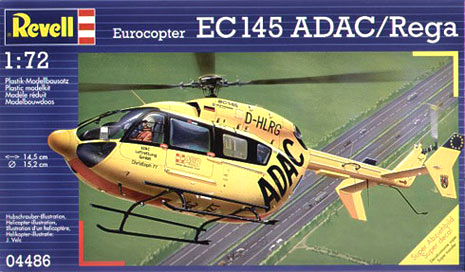 Note that I chose to portray a Swiss REGA EC-145 because the type looks cool and appropriately Euro - I do not know if in fact the two have ever worked together (and I don’t care!). This project was quite fun, although with the addition of the photoetch details, quite involved. Right out of the box the kit would be very straightforward to build and should produce a nice-looking ship. The PE parts increase complexity, but not to the point where it became tedious. I am pleased with the results despite the existence of several "nigglies." The helo was built straight out-of-the-box, and I plan on building one in "correct" 1/32nd scale :) in the near future. Kudos to Revell-Germany for producing these kits! Note that I had to use two flightdecks since one of our cats scrambled up on a shelf overhanging my workbench, sending a mostly-full can of paint thinner plunging 3 feet onto the first nearly-complete flightdeck, ruining it. - plus some minor scratchbuilding / corrections.